Holland House Bed & BreakfastHolland House retains many original features and offers fully en-suite rooms throughout with central heating, heated towel rail, 24” SmartTV, tea and coffee making facilities, clock-radio and hairdryer in all rooms. Secure Wireless Broadband is available throughout the property at no extra charge. 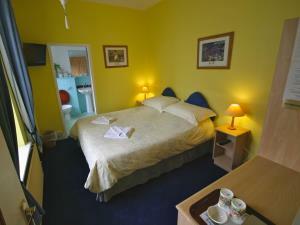 Hereford is a double room, it includes a 24” SmartTV with Freeview. The en-suite facilities include a double width shower cubicle. 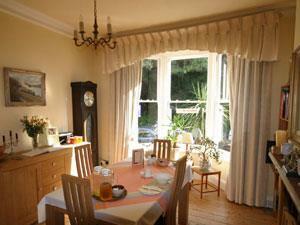 This is a cosy double room with a rear aspect catching the afternoon sun. Please note when booking this room that it is NOT suitable for a travel cot. Worcester is a king size double bed, it includes a 24” SmartTV with Freeview. The en-suite facilities include a bath with shower/mixer tap. This room is rear facing and catches the afternoon sun. Please note when booking this room that it is NOT suitable for a travel cot. The breakfast room is situated at the front of the house with a feature bay window looking out on a stand of trees - hence the terrace name “Woodland View”. Our “enjoyEngland” award winning breakfast fare ranges from the Continental style to the Full English, special dietary requirements can be catered for with prior notice. We bake our own bread and, where possible, source our meat and eggs from local suppliers. Holland House is an accredited 3 star rates property with Visit Britain and a member of the Worcester Tourism Association. A warm welcome awaits you at this mid terrace house within walking distance of the cathedral & shops. Call for discounts available for longer stays. 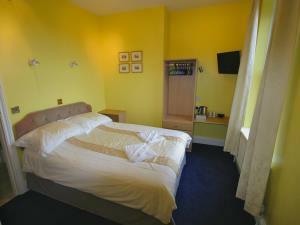 Special discounts are available for long stays and multiple room bookings please telephone for details. Holland House sometimes limits bookings to 2 or more days. Please note that this room is NOT suitable for a travel cot. Hereford sometimes limits bookings to 2 or more days. Worcester sometimes limits bookings to 2 or more days. Take the A44 into Worcester, after passing the blind college on the left, continue for 1/4 of a mile & you will see Woodland View Terrace on the left. Turn left into Marlborough Street immediately before the terrace or you may prefer to park on the A44 just below the pelican crossing. We are sorry you had trouble parking but we do make it clear on all our advertising that it is "street parking" and we have no onsite parking.